Three Billboards wasn’t as gut-wrenching as I originally thought it would be but it was still emotional. Phenomenally acted it reminds us that actions have consequences and not just for ourselves. There is no pain worse in the world than losing a child. As a parent, you feel helpless and often times lost. That pain is even worse when the circumstances behind that loss are suspect or due to criminal activity. For Mildred (Frances McDormand; Fargo), that pain is lived over and over again as she deals with her daughter's horrific death. Tired of sitting around and waiting as the killer roams free, she chooses to take matters into her own hands but she can't imagine the fall out that occurs from her seemingly harmless actions. Seven-time Academy Award nominee Three Billboards outside Ebbing, Missouri is Writer/Director Martin McDonagh's (In Bruges) vision of what happens in a small town when one person decides to not let the status quo stand. Seven months earlier, Mildred's daughter was raped and murdered on the outskirts of the small town of Ebbing. As she grieves and tries to move on with her life, Mildred is continually frustrated at the lack of movement by the Police department to catch her daughter's killer. In an act of desperation, she takes action and buys three billboards on a lonely stretch of road leading to the town. These testaments to the human resolve did nothing more than question Chief Willoughby (Woody Harrelson; War for the Planet of the Apes) as to why no arrest has been made in the murder of her child. Almost as soon as the billboards go up, the trouble starts. Racist police officer Jason Dixon (Sam Rockwell; The Way Way Back), who has previously been accused of killing a black man during interrogation, threatens the advertising guy who leases the Billboards to Mildred and then arrests the owner of the souvenir shop where Mildred works. Chief Willoughby tries to keep things from exploding while battling a losing fight with pancreatic cancer. Mildred's son, Robbie (Lucas Hedge; Manchester by the Sea) is constantly reminded of his sister and her death thanks to his "take no prisoners" mother. There is a reason Three Billboards outside Ebbing, Missouri has been nominated for seven Academy Awards - three of which are for acting. McDormand is a force to be reckoned with and doesn't take crap from anyone. She is phenomenal in this role and McDonagh was right when he imagined her in the part. Harrelson has come a long way from his portrayal as the dimwitted barkeep on Cheers and his performance is great. Rockwell takes a seemingly simple character and shows that he is really rather complex. He does this effortlessly and masterfully. Honorable mention needs to go to supporting cast members Zeljko Ivanek (True Blood), Hedge and Peter Dinklage (Game of Thrones). McDonagh's scripts tend to be macabre and Three Billboards is a more subtle version of this. His characters seem outwardly simple but, like most human beings, are really more complex. As we see their actions create a domino effect and watch as their lives intertwine, we can appreciate how precious life and emotions can be. His direction is excellent and at no point did I find the story sluggish or boring. My only criticism perhaps is the ending. It left me feeling a little unfulfilled. The 4K UHD Blu-ray has presented in 2160p HDR10 video and the results are incredible. The billboards on fire a sight to see as the reds, yellows, and oranges dance amid a backdrop of deep black. The greens of the town foliage are lush and the clarity of skin and facial features during close-ups are jarring. The DTS-HD 5.1 Audio is sharp and clean with no artifacting. The Combo pack comes with the 4K disc. A regular Blu-ray disc and digital download code. There are only two, but lengthy, extras. They are Crucify 'Em: The Making of Three Billboards and Six Shooter (Short Film). While interesting, they don't offer all that much other than an interesting subsection of Crucify they look at the logistics of one scene that was shot all in one take. Three Billboards wasn't as gut-wrenching as I originally thought it would be but it was still emotional. Phenomenally acted, it reminds us that actions have consequences and not just for ourselves. 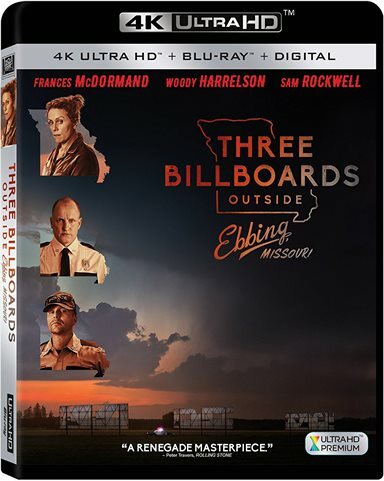 Download Three Billboards Outside Ebbing, Missouri from the iTunes Store in Digial HD. For more information about Three Billboards Outside Ebbing, Missouri visit the FlickDirect Movie Database.